Each year the Bill Gates, co-founder of Microsoft and co-founder of the Bill and Melinda Gates Foundation, provides an annual letter, outlining the achievements, successes and Direction of the Foundation. This year Bill mentions the address by his father, Mr Bill Gates Snr, to the Lions International Convention in Seattle, and compliments Lions Clubs International on its work. Lions Clubs International is partnering with the Bill & Melinda Gates Foundation to support a Lions-Measles pilot program in four African countries. 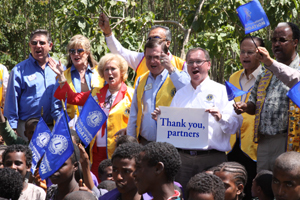 The Foundation is providing $400,000 and LCIF is providing an additional US$300,000 and Lions are managing and implementing the projects. In supporting the pilot program, Lions join the Measles Initiative, a worldwide effort. The partnership helped vaccinate 41 million children. For the full letter, please select this link here. Link to Bill Gates Annual letter. ‹ PreviousCharter night for Lions Club of Sydney Selective Inc.